The school, which was closed after the students demonstration, is expected to resume on April 8. Member of Parliament for Efutu, Alexander Afenyo Markin, has called on stakeholders in the impasse at the University of Education, Winneba (UEW), to adopt a reconciliatory path to bring to an end the crisis at the University. 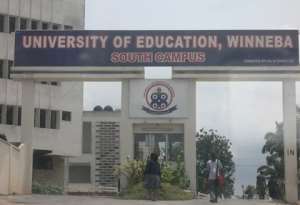 The University, located in Winneba in the Efutu Constituency, in the Central Region, has been closed down for nearly a month after students’ demonstration over the dismissal of some lecturers and staff by the Vice Chancellor Very Rev. Fr. Prof. Anthony Afful-Broni. However, the MP has indicated that the decision to reinstate only three of the lecturers does not reflect the consensus reached among stakeholders. Mr Afenyo Markin told journalists at a mini press conference, at the Parliament House, in Accra: “we need a peaceful University of Education,” and appealed to the Vice-Chancellor to be ready, with a reconciliatory approach, coupled with his religious background to bring the impasse to an end. Students of the University have expressed misgivings about the leadership style of the Vice Chancellor, and described it as authoritarian.